I love the sparkle ! Can't go wrong with it. I have actually used pearl bling swirl. Of course there's bling on the tires as well. I do tend to go over board for this but what can I say I LOVE GLITTER !! 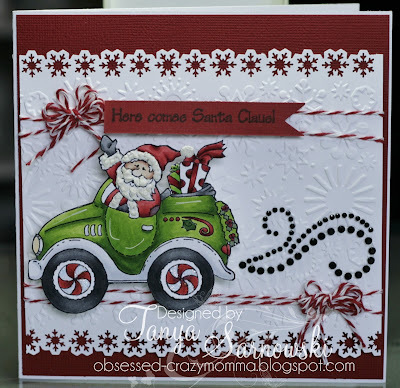 SO I am showcasing Road trip Santa ...to cute.Now I could have colored the card the classic Red but I felt a little lime green convertible would be waaay more fun lol. Release Day and Blog Hop.Be sure to stop by to win prizes !! Oh I love this Santa.